Much can be indicated about beveling processes, glass itself is a fascinating structure at the molecular level, appropriately for the purposes of glazing, mirror itself has many modes, types, and decorative treatments. As a standard, most do not bevel antique mirror, typically the request is to accent or ornament a modern or contemporary frame, even a beveled mirror with no frame. Some beveling is done by hand, if shaped or chipped (barked), or if by straight line, it is machined. Important facts about standard, clear mirror, below. Thickness can be at a minimum of 1/8″ thick to a maximum 3/4″. Our standard clear is available in non fingerprint, tempered, Archivac safety-backed, and self cleaning mirror. 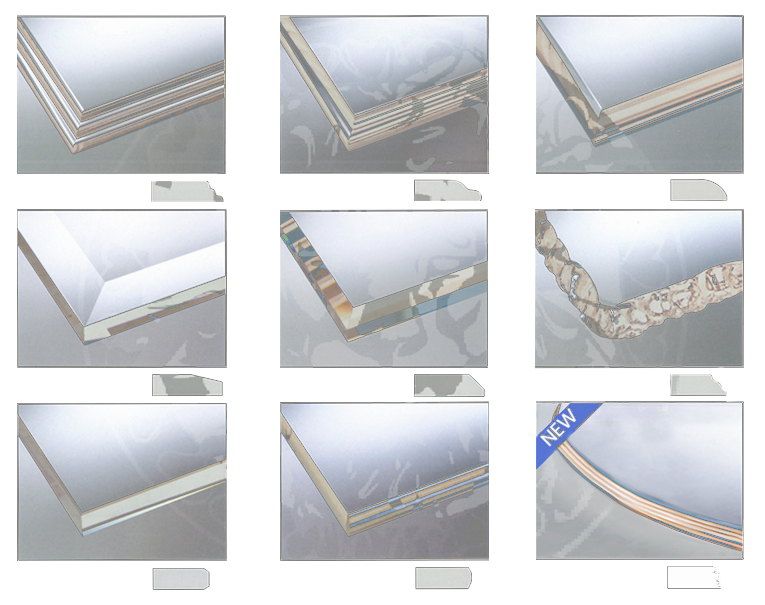 When requesting a quote,please indicate desired mirror/bevel types, and our quote will be generated with varying pricing, dependent on desired choices.